Stella's Musings: Doha Bound: I have got mixed feelings! Its Tuesday night and I can't wait for next twenty four hours to pass by. The reason is, on Thursday early morning, I will take a flight to Doha, Qatar. That's the city where this year's UN Climate change summit or COP18 as its called, is happening. 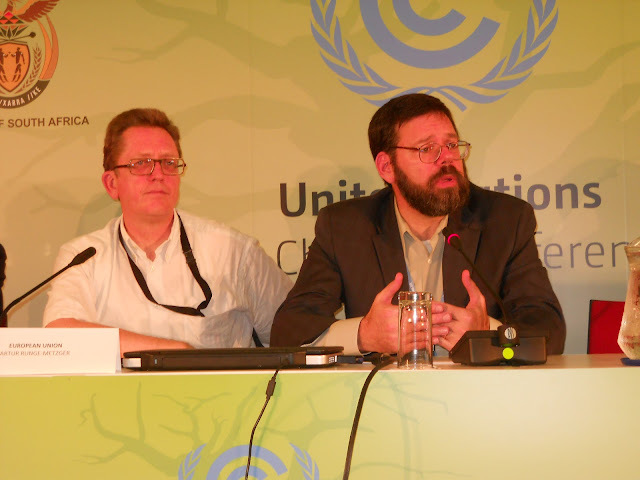 Jonathan Pershing - negotiator from the US, playing his role of a climate denier to the perfection at COP17 in Durban at 2011. Wonder if he has mellowed down a bit since then! It will be my second straight year at a COP. It, however, almost didn't happen. Because, the Climate Change Media Partnership fellowship, offered jointly by Internews, IIED and Panos London - which had sent me to Durban last year, was cancelled this year for lack of fund. I had applied again and was also short listed. So, when the fellowship was cancelled, my hopes were dashed. But then, like a miracle, I got a sponsorship, from United Nations Convention to Combat Desertification(UNCCD). Relatively a new UN entity, UNCCD has been extremely supportive of environmental journalist since the very beginning. In fact, it was the UNCCD that had organized a media workshop in Inner Mongolia of China earlier this year - one that I was fortunate to be a part of. Along with me, UNCCD is sponsoring another journalist from Togo. Now, as I prepare for my trip, I have got a bag of mixed feelings: on one hand I am extremely happy to have got another chance to cover the climate summit. Being on the UNCCD team - I will be there as a member of the UNCCD delegation, instead of an individual journalist - means I will get closer chance to learn of and report on the issues that I deeply care about: land, forest and water. I also am happy that my experience of covering a COP from Durban can really come handy now. 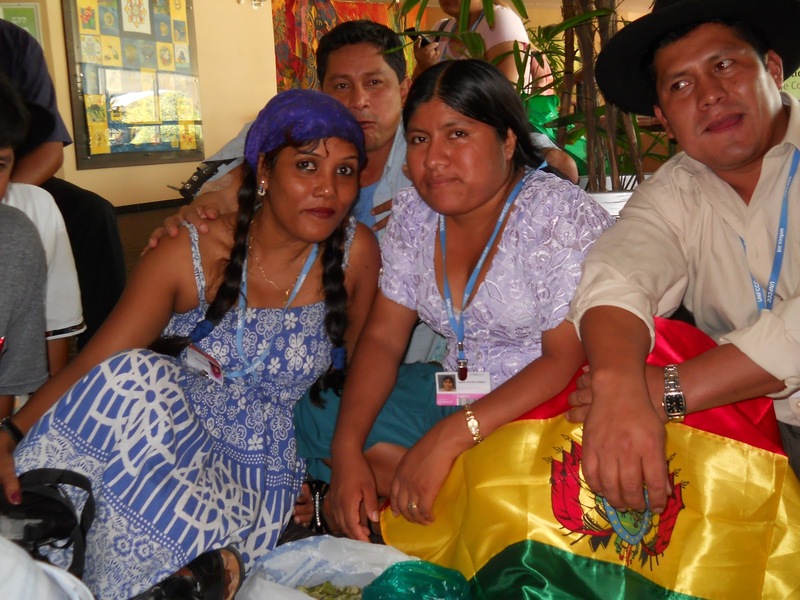 The forest day celebration at COP18 was special. We had heard a lot about what REDD+ could do to. 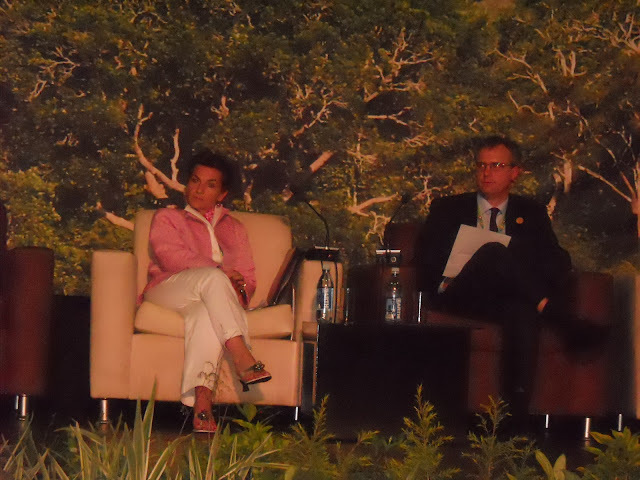 I will be attending the Forest day again at COP18 and will try to track the promises made last year. 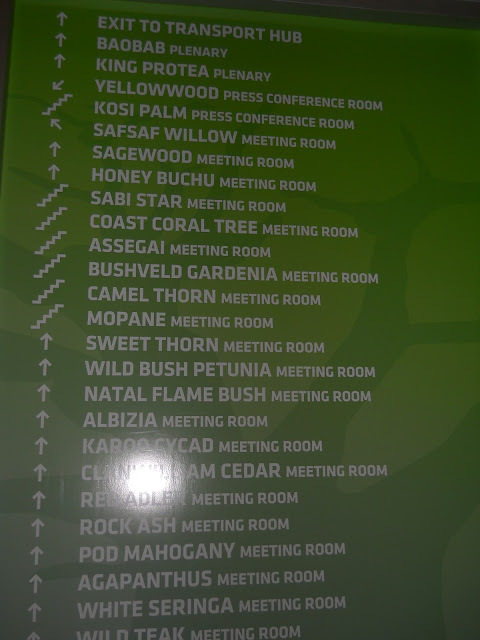 The various meeting rooms at COP17 - each one named after an African river. But why am I still sad? Its because the Climate Change Media Partnership fellowship - the only fellowship that gives a once-in-a- lifetime opportunity to environmental journalists from developing countries to cover the summit - couldn't find funding! This keeps reminding me how low environmental journalism, especially climate change sits on the priority list of philanthropists and donor organizations. In fact, it shows how little those with money still care about climate change or a sustainable world. 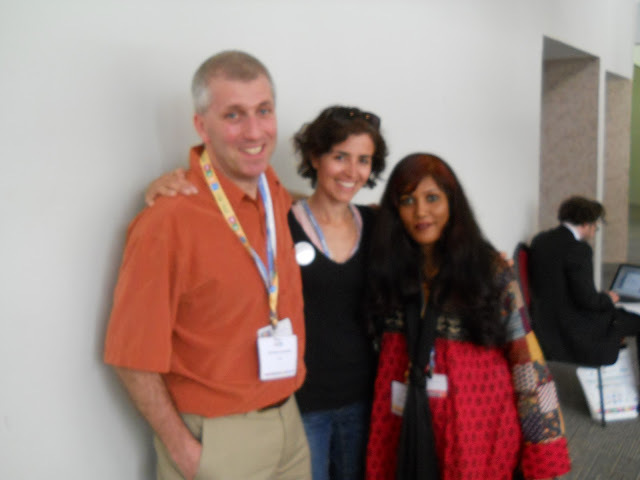 With fellow environmental journalists and Climate Change Media Partnership fellows -Jeff from the US and Gabriella from Argentina at COP17. Will miss them this year! 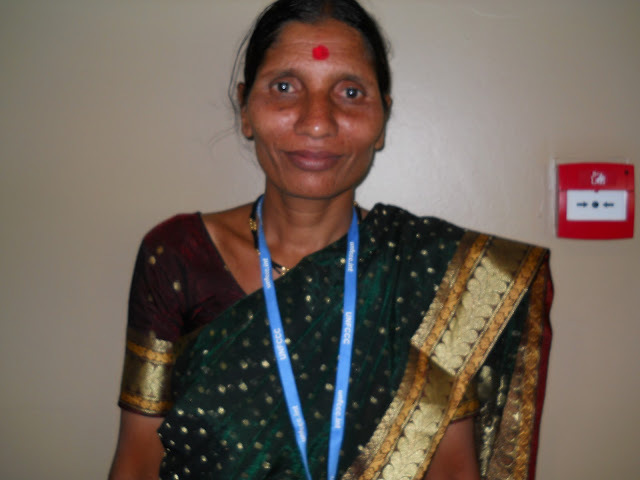 Suman More - an Indian trash picker in Durban COP17. My story on her won the UNFPA award for best gender sensitive reporting this year. I give the credit to this amazing woman! With these mixed feelings and also the hope that things will soon change for the better, I will be boarding the flight to Dubai on Thursday. In Doha, my focus will be land, forests, food security and renewable energy. As always, my stories will have a strong gender perspective. I will report for Reuters/Alertnet, Global Press Institute and UNCCD - my sponsor organization. So, see you there. Also, see you on twitter and also on Facebook! Pretty amazing. I wish I could attend such programmes.